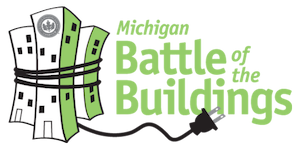 The Michigan Battle of the Buildings October 23rd Lunch & Learn hosted by Progressive AE brought together area professionals to challenge our traditional thinking around energy efficiency projects and how we need to frame these discussions with our CFO’s (Chief Financial Officers). “COST is a four letter word” said Tom Frey an engineer at Progressive AE. Competition for capital dollars is always a challenge for building operators/managers and while there is no question that ROI (Return on Investment), NPV (Net Present Value) and IRR (Internal Rate of Return) are excellent evaluation tools, they do not properly reflect the avoided costs of future energy consumption. Proposing your energy conservation project in a way that displays the reduction in operating budget due to the new system(s) will prove the projects greatest benefit – improved cash flow. Using finance mechanisms (like PACE, Michigan Saves or Performance Contracting) and factoring in the accelerated depreciation opportunities can help structure an energy project that will use the avoided the energy costs to pay off the original investment and continue to reap the benefits long afterwards. This could mean you don’t have to compete with other capital projects for funding. The conversation also focused on the benefit of bundling projects. If funding is approved to complete a lighting retrofit with a 1 year payback this year, you may get shot down when you ask for capital to fund a new boiler with an 8 year payback next year. Bundling multiple upgrades can help you get projects approved that may not fly on their own. “The last solar project we completed yielded a payback of 2 years and that included a new roof (which had no payback on its own).” stated David Bell, an engineer at Progressive AE. ENERGY STAR provides tools and resources that can accurately capture the benefits and prove that energy efficiency projects are excellent investments. These tools are available at www.energystar.gov and include the Financial Value Calculator, Portfolio Manager, Target Finder, and the Cash Flow Opportunity Calculator. “It is our job as building management partners to frame our discussions in a way that provides the true INVESTMENT potential in a project that reduces the operating budget.” Said Tom Frey during the wrap up. These are not the type of discussions we were having just a few years ago.